My train of thought was inspired by her words “people influence the development and content of the web“. Take the ‘flipped classroom’ as an example, according to Gerstein “The teacher-to-student and student-to-student relationships are considered as part of the learning process. Education 2.0 focuses on the three Cs – communicating, contributing, and collaborating”. Flipped Classroom is a great example of Education 2.0, in its learning environment, Technology helps teachers transform the information out of the four walls of the classroom and students work on themselves and then assimilating, contextualizing, making meaning and working together. These learning activities encourage and prompt students to utilize their acquainted social networking tools to build a collaborative learning context, furthermore, web 2.0 tools empower students to choose the methods which best works for them to demonstrate their learning outcomes “Learners already possess many skills related to self-determined learning due to their informal learning experiences interacting with the web“. (Jackie Gerstein). It can be noticed that, learning methods during this process are involving , and the roles of either learners and educators are experiencing a profound change. “People influence the development and content of the web” Gerstein’s words deserve to read over and over again. Involvement and collaboration through the world made the advent of Wikipedia. People’s experience, interests, specialties and the enthusiasm on sharing add significant educational value to those social tools like Twitter, Facebook and Youtube. Like Sapna said in her post, “There will be no Facebook or YouTube if no one posts content or videos to those platforms”. This video clearly shows us those in the past identified as receptacles or consumers of knowledge,are successfully involving their roles being connectors, creators and constructivists in learning contexts. 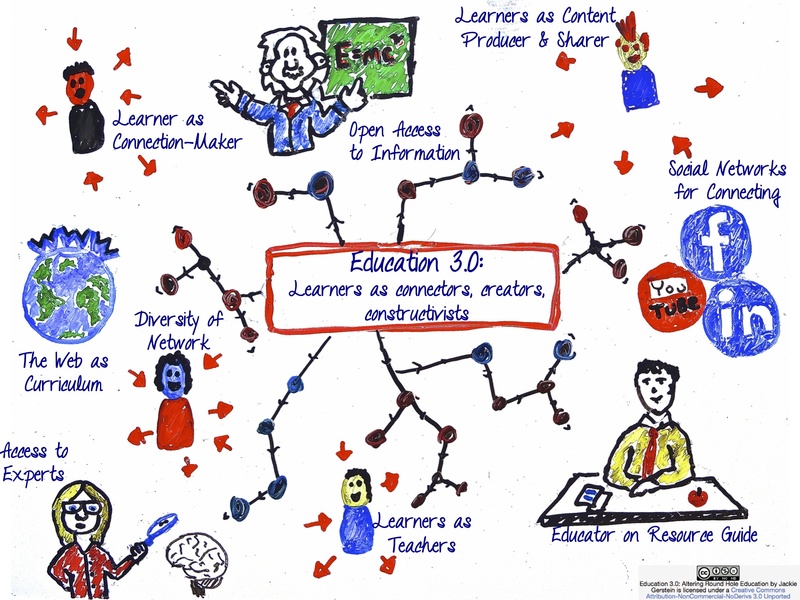 Jackie Gerstein’s image vividly shows us how does Education 3.0 operate in learning and illustrates the role of both students and educators in an Education 3.0 context, which precisely mirrors what we do in EC&I 833. According to Jackie Gerstein, “Form their own learning communities possibly using social networking tools suggested and/or set up by the educator. Possible networks, many with corresponding apps, include: Facebook, Twitter, Edmodo, Instagram, Blogging sites, Youtube, and other social networks”. Blog Hub in EC&I 833 is a learning community from which each member contributes and benefits. Every post in Blog Hub is not a static information source, but a dynamic knowledge data base accumulated from members’ learning experience and highly autonomous and self-determined learning outcomes. “The student should be central to education – not the content, not the tests, not the standards, not what we think students should know and do”. Next Next post: Quizlet helps learn vocabulary but teachers should intervene more than ever before. I feel there is no apparent turning point for 2.0 to 3.0. It feels the Web 2.0 develop naturally into 3.0. I feel your explanation and the pic you found makes me get clearer idea.